Gavin Murphy: Remember, The Golden Bough, Dublin City Gallery; Courtesy of Dublin City Gallery, The Hugh Lane. There’s something simultaneously intriguing and awful about that compact oval space used to present the Golden Bough exhibitions. I’ve made numerous visits to the Dublin City Gallery, The Hugh Lane over the last couple of years and see what’s in that room each and every time, but I still don’t feel totally comfortable with that space. Perhaps this contradictory reaction says something of my own conditioned expectations courtesy the art world. After all, most galleries and museums place art in nice, tidy white boxes. Some institutions – the New York Guggenheim and Washington, DC’s Hirschhorn Museum come to mind – contend with non-rectilinear spaces on a regular basis, though the curving walls tend to limit what can potentially be shown. Complicating the Hugh Lane space is its obtrusive symmetry. This quality hits you the minute the gallery is entered. The path of entry not only bisects that shallow space, but also causes peripheral vision to go momentarily wonky with its left and right wings competing for attention. Many turn one way or the other, surmise the room’s content at a glance and depart. I find that interesting and wonder what it is that they are seeking. If it’s immediate visual impact, then they will bound to be disappointed. The art in this room typically inspires contemplation. Its content and the meanings that can be ascribed to it, seep out slowly. Reaping what it has to offer requires an open mind, time to linger and a bit of mental mastication. Gavin Murphy’s recent contribution to the Golden Bough operates in just the same way. Visually, it’s underwhelming. The modest set of objects which consist of a grouping of transparent sign-like acrylic panels, modest images of books, two minimalist folding screens, and a potted plant, connote an absence of information. Their distribution appears haphazard and they seem to be conceptually disjointed. 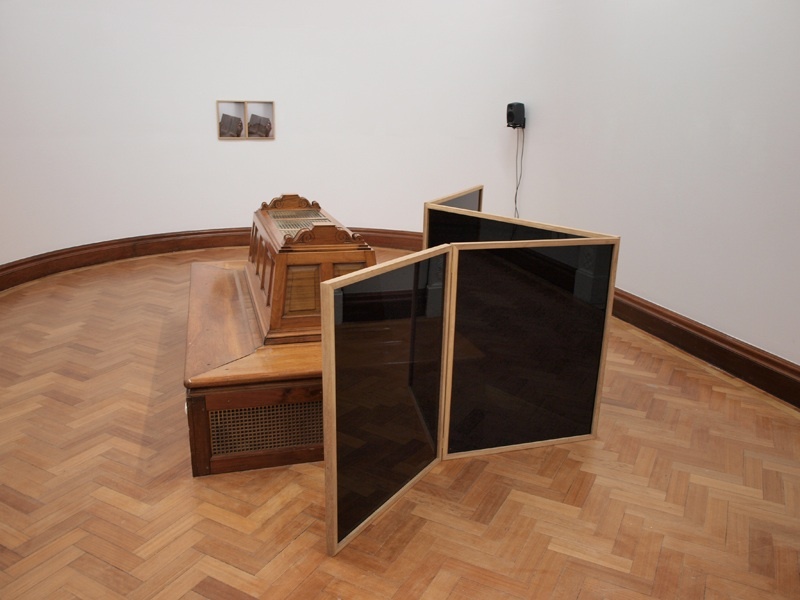 Rounding out the installation is a two channel audio recording which contributes to the lifeless aura. The voice delivering a string of fact filled sound bites speaks in an unappealing, matter-of-fact tone that fails to ingratiate itself with listeners. People attuned to the responsiveness of the latest interactive gadgets streaming digital content may find it a purgatorial experience. Gavin Murphy: Remember, The Golden Bough; Courtesy of Dublin City Gallery, The Hugh Lane. Given a good look and listen though, Murphy’s output rewarded visitors with a complex mix of history and ideas that charts important shifts in the interpretation, value, and use of cultural material and the evolution of Charlemont House in particular. In speaking about memory, compilation, loss, and rebirth, the exhibition refers to art collections, libraries, encyclopaedias and architecture, and delineates relationships between paintings, sculptures, photographs and books. The installation neither wholly rejects nor totally conforms to the room’s configuration. Binary relationships, evident in aspects of the structure and content of the work, do resonate through the space. From the recording viewers hear about the illusion of depth in the work of early modern writers and painters, as well as Dublin City Gallery’s dual objective of mitigating the negative effects of light on art works and providing proper illumination while they are on display. Of the objects, the screens form the most obvious example. Though one is black and the other white, they mirror each other in terms of scale, configuration and placement. The exhibition leaves one feeling burdened with the weight of cultural history; what is an overwhelmingly complex mass of information and inferences that – despite the best efforts to reclaim, organise and preserve it – continues to be collected and squandered, built-up and subject to deterioration. Murphy directs attention to these opposite processes. Their cumulative effect constitutes a dense nothingness. In Eulogy to the Blank Page (2010), the eyes peer at and through words of air that speak about educating one’s self to silence; whose transparent contours become unreadable through superimposition or disappear as one moves around them. As details of the narrator’s discourse accumulate, facts disappear under more facts and recalling all of them becomes increasingly difficult. Empty pages are displayed in a framed notebook and have been manifested in the screens. The reflectivity and deep hue of the black one, The Novel as Journey through the Centuries and Continents (2010), evokes an impenetrable solidity, whereas the white partition, The Novel as Utopia of a World that has no Forgetting in it (2010), suggests an altogether different type of aggregate. I associated this ultimate kind of awareness with the idea of light and thought of the visible spectrum which, in its accumulated state, exists as white light. Though the title of Murphy’s exhibition didn’t first grab me, a quick visit told me I needed to return. After my second visit the title took on a haunting, much more urgent tone. It stopped being a name and became a one word statement, albeit without punctuation, which makes it open to interpretation. So, I started wondering about its function. Was to be read as a question or a command? Could it be an exclamation? Should I consider it to be a tactful hint, a stern warning or a cry for help? Do I take it seriously, as an obligation or enjoy it in the way one might pursue a casual interest or hobby? In some ways, I still can’t help thinking it stands as a comment on our increasingly amnesic society; a society whose preoccupation with the present erodes its sense of continuity and steadily disconnects it from its past. The gallery describes the exhibition as a consideration of “the arts as system,” which suggests an orderly network of processes. Remember conveys this notion and contradicts it. It depicts the strands of cultural history as material that can be woven together to elucidate particular developments or support certain assumptions and as a convoluted entity that evades full comprehension and stymies total recall. Moreover, it also delineates the shortcomings of books and buildings, the historical storehouses for such content: ultimately incomplete and imperfect frameworks that, like the room that housed Remember, invariably merit attention.